What started as a normal event for Raymond Pedigo of Woodbury turned into a nightmare. Raymond's daily routine of taking his longtime canine companion Spot for a walk, went south when Spot decided to run outside of his normal boundaries. Raymond quickly begins searching throughout the area and cannot locate his four-legged friend. Raymond looks everywhere and it is obvious Spot has gotten lost and can't find his way back home. Spot is officially missing! Days go by and still no Spot. Raymond's daughter Jan is concerned that Spot may never return and after a week or so she starts thinking that it would be a good idea to get her dad a new dog just like Spot. The search for Spot's replacement begins. In the meantime, Lisa Hall of Shelbyville is with her family at Normandy Lake on a weekend getaway at the Barton Springs Campground. At the campground, one of the hosts approaches her holding a small dog named Buddy that had been left with her at the Barton Springs Bait & Tackle Shop. The host asked Lisa if she would be interested in a new family member, but Lisa quickly decided she had more than enough mouths to feed and declined, but offered to help find a home for Buddy. She quickly took a picture and posted on Facebook to get the word out. While these events are happening Raymond's daughter Jan, shares the bad news of Spot's disappearance with her longtime friend Dana Thomas of Shelbyville. She asks Dana to be on the lookout for a dog that she might give her father to replace Spot. Dana shares this information with her friend Keeley Graves of Shelbyville. Keeley sees the post from Lisa Hall concerning an abandoned dog named Buddy that needs a home and shares the photo with Dana. Dana contacts Jan and she decides this abandoned dog looks similar to Spot and agrees that it could be the perfect replacement for Spot. Jan makes arrangments to meet Lisa in Murfreesboro so she can see Buddy and decide on whether or not he would be a good fit. Jan and Lisa meet and as soon as Jan laid eyes on Buddy she notices that he looked a lot like Spot. But she thought, NO, this is not possible.She agreed to take Buddy and give him to her dad since he looked a lot like Spot. Raymond had been under the weather a bit and Jan decided she would wait a while before presenting Buddy as a replacement. But, after being around Buddy for a while she decided that she could not wait any longer. She had to get her dad this new guy named Buddy. Jan takes Buddy to his new home to find out that its not his new home. Its been his home all along. Raymond is shocked and so happy to see that Spot has been found! Little does he know that Spot had been on a crazy adventure in middle Tennessee. 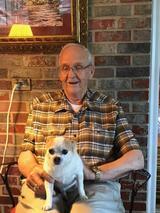 Raymond is now reunited with his long time friend and sends a big Thank You to all of those who were willing to take care of Buddy (Spot) in the process. Most stories of lost pets do not have a happy ending like this one. We had to tell the story of Spot and his great adventure and safe return.